Brian's research interests include object-oriented programming, design, reuse, languages, frameworks, software architecture, patterns, reflection, metalevel architecture, and software evolution, for starters. I've managed to come up with electronic copies of all my publications and workshop position papers (and several talks as well) going back to 1985. These can be accessed via the links below. These are organized into the following categories. Some probably belong in more than one category. Direct hypertext links are given for papers for which HTML versions exist (such as Designing Reusable Classes). Links to versions in other formats are given after each paper's pseudo-bibliographic entry. 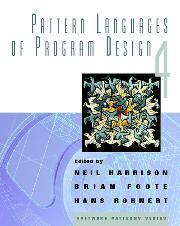 This volume is part of the Addison-Wesley Software Patterns Series. Brian also wrote an introduction for this volume. Also see the UIUC Metadata Pattern Mining '98 Workshop page. Click here for a table of the Design Rules from this paper. Where Do Reusable Objects Come From? For more information on refactoring, see our Lifecycle and Refactoring Patterns paper and John Brant's Refactory page. John Vlissides, Ralph Johnson, Erich Gamma, Neil Harrison, et al. Click here to read the in absentia confession entered by the court for Richard Helm. Object-Oriented Reflective Metalevel Architectures:  Pyrite or Panacea? The electronic proceedings of the workshop are also available via ftp. The electronic samizdat proceedings of the workshop are available via ftp. I have been working with Smalltalk-80 for over ten years, beginning with Dave Ungar's BS, and the Apple Smalltalk that appeared on the Lisa and Macintosh during the mid-80s. From there, I've worked my way though the succession of ParcPlace Smalltalk-80 incarnations. I was exposed early on to Smalltalk-V as well. Smalltalk has been at the foundation of much of my work, including Designing to Facilitate Change with Object-Oriented Frameworks and Reflective Facilities in Smalltalk-80. I am a member (a charter member, in fact) of Ralph Johnson's Smalltalk Group at the Dept. of Computer Science at the University of Illinois at Urbana-Champaign. The Smalltalk Group curates the UIUC's Smalltalk Archive. Click here to get the Adobe Acrobat Reader application. Click here to download the Microsoft Word Viewer application.